Written with the help of the Northern Ponca tribe, and using the long dusty files of the Omaha Daily Herald among the many sources he studied, Stephen Dando-Collins was the first to reveal to today's readers the amazing, sad, but ultimately heart-warming story of Standing Bear and his people. In 1877, Standing Bear and his tribe, the Ponca, were forcibly removed from their land in northern Nebraska. In defiance, Standing Bear sued in U.S. District Court for the right to return home. In a landmark case, the judge, for the first time in U.S. history, recognized Native American rights-acknowledging that "Standing Bear is a person"-and ruled in favor of Standing Bear. 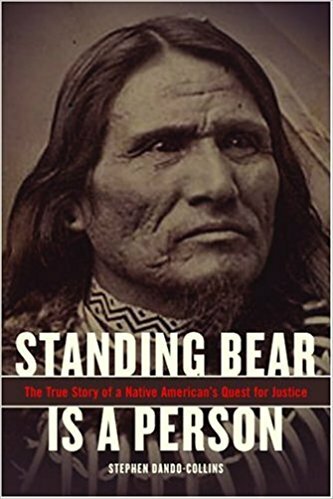 Standing Bear Is a Person is the fascinating behind-the-scenes story of that landmark 1879 court case, and the subsequent reverberations of the judge's ruling across nineteenth-century America. It is also a story filled with memorable characters typical of the Old West-the crusty and wise Indian chief, Standing Bear, the Army Indian-fighting general who became a strong Indian supporter, the crusading newspaper editor who championed Standing Bear's cause, and the "most beautiful Indian maiden of her time," Bright Eyes, who became Standing Bear's national spokesperson. At a time when America was obsessed with winning the West, no matter what, this is an intensely human story and a small victory for compassion. Stephen and his wife Louise joined the Northern Ponca in Nebraska for their annual pow wow in 2006. They even attended a Ponca language class in the historic agency building on the Ponca Reservation which features so prominently in this story. The couple found their visit a profoundly spiritual experience, and will be eternally grateful to the Ponca for the gracious way they were treated and for the tribe's wholehearted assistance with the research for the book. At one point, Stephen said to his hosts, "I hope you don't mind a person who is not Native American writing about you." To which the Ponca said, "Stephen, we are honored if anyone writes about us." As a result of reading this book once it was published, two Lincoln, Nebraska men set out on a mission to locate the unmarked grave of Standing Bear's daughter Prairie Flower at Milford, Nebraska mentioned in an early chapter. They succeeded, finding and marking the grave for posterity.